Dear Outer Space: Chapbooks Get Some Good Press! Chapbooks Get Some Good Press! 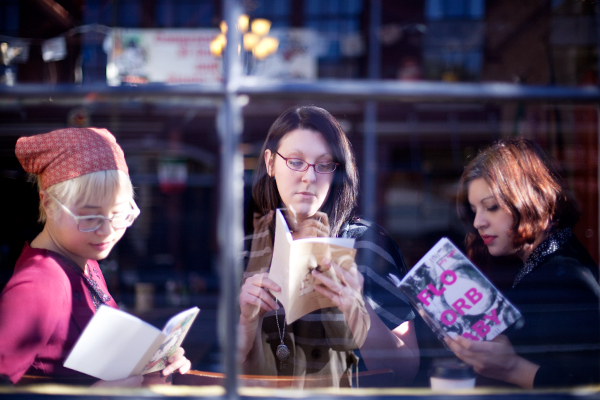 Laura (center) and fellow ModCloth Writers, Esme (left) and Angela (right) reading chapbooks! photo taken by Erin and borrowed from the ModCloth blog! During my stint as a fashion writer this holiday season, I got the chance to write for the ModCloth blog. I decided to introduce their crafty, creative, and fashionable readers to the world of poetry chapbooks! I featured chapbooks from Dancing Girl, Blood Pudding, and Birds of Lace Presses. Definitely check out the post and leave your favorite press and chapbook titles in the comments over there.